Today, Visio Guy will show you how to create a three-bar SmartShape and link it to data using Visio 2007 Professional’s brilliant “Link Data to Shapes” feature. We’ll cover the intricacies of creating a shape that visually reacts to data, and show you how to link instances of this shape to actual rows of data in an Excel spreadsheet! This is the first in a three-part series on data graphics and data linking, so read-on, and stay tuned! 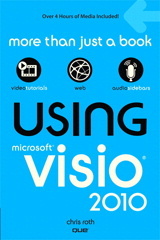 Visio 2007 has many cool new features, and among the coolest are Data Linking and Data Graphics. These data features allow shapes to link to data-sources and graphically react to it. You can also add Data Callouts as adornments to existing shapes. The callouts display data next to a shape without visually changing the actual shape. Of course, if you’re a Visio Guy like me, you won’t be content to sit back and use the pre-built Data Graphics supplied by The Man. You’ll want to roll up your sleeves and create your own, thank you very much. So I’ve scoured the net to find resources that contain the nitty-gritties about Data Graphics. Have a look, and stay up all night!